I pay attention to detail. I’m not nosey, I’m just observant. I see women who turn to men all the time for dependence and attention. Are they afraid of being alone? Are they afraid of taking care of themselves? I question this, especially the ones who have children because those children are seeing mom with different men or moving in with a man and they’ve only been around a little while. Which means there is a greater chance that those children will grow up and do the same thing. Wanna know who I depend on? You got it GOD! I do not need a man to provide anything for me. God provides for my needs. Financial and emotional. He is trustworthy, always faithful, and will never stop loving me. God doesn’t lie and He treats me like I’m the only daughter He has. Living for God and then letting Him bring you the perfect person for your life is what I think is the best and wisest choice. I trust Him. He has my best interests at heart. 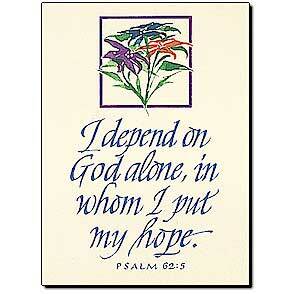 I fully depend on God. Why don’t you try it? What have you got to lose? ← What are you focused on?